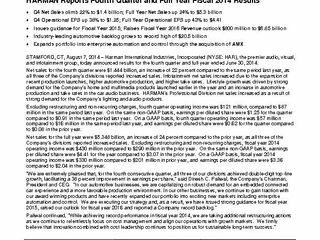 STAMFORD, CT, August 7, 2014 – Harman International Industries, Incorporated (NYSE: HAR), the premier audio, visual, and infotainment group, today announced results for the fourth quarter and full year ended June 30, 2014. Net sales for the fourth quarter were $1.444 billion, an increase of 22 percent compared to the same period last year, as all three of the Company’s divisions reported increased sales. Infotainment net sales increased due to the expansion of recent production launches, higher automotive production, and higher take rates. Lifestyle growth was driven by strong demand for the Company’s home and multimedia products launched earlier in the year and an increase in automotive production and take rates in the car audio business. HARMAN’s Professional Division net sales increased as a result of strong demand for the Company’s lighting and audio products. Excluding restructuring and non-recurring charges, fourth quarter operating income was $121 million, compared to $87 million in the same period last year. On the same non-GAAP basis, earnings per diluted share were $1.25 for the quarter compared to $0.91 in the same period last year. On a GAAP basis, fourth quarter operating income was $57 million compared to $16 million in the same period last year, and earnings per diluted share were $0.62 for the quarter compared to $0.08 in the prior year. Net sales for the full year were $5.348 billion, an increase of 24 percent compared to the prior year, as all three of the Company’s divisions reported increased sales. Excluding restructuring and non-recurring charges, fiscal year 2014 operating income was $430 million compared to $290 million in the prior year. On the same non-GAAP basis, earnings per diluted share were $4.41 for the year compared to $3.07 in the prior year. On a GAAP basis, fiscal year 2014 operating income was $330 million compared to $201 million in prior year, and earnings per diluted share were $3.36 compared to $2.04 in the prior year.